We went in search of Bigfoot but, quite honestly, we didn't look that hard. Why not? Simple. There was too much else to see. Samples? A river with tumbling white water. A bay where we paddled mirror-still waters at night. An amazingly elegant Victorian hotel with sumptuous gourmet dinners. A cookhouse that turns out hearty all-you-can-eat lumber camp meals. Miles of dazzling beaches with pounding surf. Trails through towering stands of magnificent redwoods. A town that brazenly touts its lumber heritage. Another town that rightfully prides itself as one of America's "prettiest towns." Contrasts are part of the allure in far Northern California's Humboldt County, with 2.3-million acres of forests, coastlines, and surprises. It's here that eureka takes on new meaning. The dictionary defines eureka as "discovering something." In Greek it translates to, "I have found it." In Humboldt County, Eurekas 27,000 residents make it the northern California coast's largest city, and a logical starting point for discovering the region's varied interests. Located 284 miles north of San Francisco and 466 miles south of Portland, Oregon, Eureka is surrounded by 160,000 acres of redwood forests, valleys and hills with 110 miles of coastline. Its early pioneer history ties to the settling and development of San Francisco. When Eureka was chartered in 1856, it had seven sawmills that monthly produced two million board feet of timber. 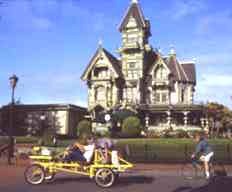 Old Town Eureka features more than 10,000 classically ornate Victorian homes, including the fantasyland-like Carson Mansion, completed by pioneer lumber baron William Carson in 1886. Carson privately financed its construction to keep 100 of his men working. 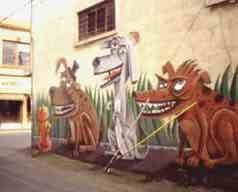 Just a few blocks away is a colorfully eccentric downtown enlivened by a wacky variety of wall-side murals and the see-it-to-believe-it Romana Gabriel Sculpture Garden. With more than 8,000 artists in the county, Eureka revels in its distinction as the "Best Small Art Town in America." South of town is the Fort Humboldt Museum and State Historical Park, where in 1854 a discontented Army captain named Ulysses S. Grant, then known as Sam Grant, suffered through miserable months of duty. In contrast, for my wife Mary and I, our stay in Eureka was anything but miserable. Suffer we didn't. 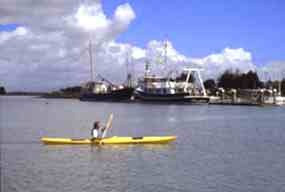 It was after 10:00 p.m. on the night that we joined Jay Dottle at his dock on Humboldt Bay. Jay is owner of the Boats Sailing, Canoe and Kayak Center, in Old Town Eureka. An unusually high tide meant the rising waters would practically cover Indian Island, a short paddle across the bay's glassy waters. Paddling our sea kayaks, we glided underneath a star-freckled sky. We aimed our kayaks over the submerging island, toward towering trees lit with huge, ornament-like egrets, their surrealistic white feathers glowing ghost-like. As we neared the trees, the somnolent silence erupted with cranky "CHRanoK!" sounds as the spiny egrets took flight. Over the next few hours we plied through various bay channels, some as wide as two-lane highways, others as narrow as bowling lanes. On the way back we glided like thieves, stealthily passing alongside sailboats, then bending limbo-low under docks and walkways. Hum-Boats owner, JayDottle, paddles the bay Dottle offers special tours throughout the year, including full moon paddles, high tide excursions, and meandering trips through the isolated Hookton slough, seasonally plentiful with marsh birds, raptors and geese. From the comfortable Southport Landing, a nearby bed and breakfast inn, it was a short drive to a pair of hiking trails and launching spots for paddling the slough at high tide. More than 370 species of birds fly the coastal region here. Whale watching is also popular between March and June, and then again from September through January, during the migration between Baja California and Alaska. The dinner took hours; the anticipation created goose bumps. Five courses, each with a specially selected wine, were served reverently, like offerings at an altar, each more pleasing to the eye than the last. Dining at the Carter House's 301 Restaurant is truly a celebration of the palate. The showcase meals, celebrated in such magazines as "Food & Wine" and "Bon Appetit," include regional delicacies like Kumamoto oysters and fresh salmon, featuring herbs, greens, vegetables, and edible flowers from the restaurant gardens. At 30 pages, the wine list is almost as thick as Eureka's phone book. The Carter House is actually an enclave of three splendid Victorians. We spent the night in the original Carter House, where our room included original local art, fresh flowers, a marble fireplace and a four-poster bed that was so immense that we played hide-and-seek. Before dinner we sipped wine and munched hors doeuvres, and afterwards nibbled home-baked cookies and slurped tea. The ambiance flip-flopped a night later as we hunkered over all-you-can-eat helpings of soup, salad, chicken, roast beef, potatoes, vegetables and slices of apple pie at Eureka's best-known eatery, the Samoa Cookhouse. Billed as "The Last Surviving Cookhouse in the West," it began serving mill workers in 1893. The restaurant's museum features mementoes of the region's bygone logging era. Diners eat lumber-camp-style at oil cloth covered long tables. Nothing fancy, just down-home tasty. Sunshine splashed us more than the white water. 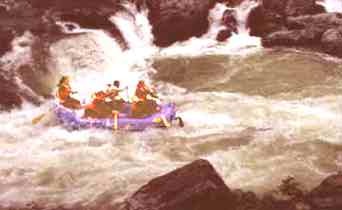 The rapids along the Trinity River were mostly non-threatening as the roller-coaster river passed through expansive scenery and wildlife. We knew when the larger rapids were ahead when we saw cars pulled off the road along bordering Highway 299, the passengers ready with their cameras. Our guide from the Bigfoot Rafting Company aimed our raft head-on for the frothiest sections of the river. We yelped and hollered while paddling through the tallest standing waves and deepest holes. We whooped even louder as we watched another raft sputter and stall, then flip, emptying its passengers like discarded litter. Humboldt's Trinity, Klamath, Smith and Salmon rivers provide some of California's best rip-roaring white water. We spent the night in Willow Creek, a mountain community 50 miles east of Eureka that's proud of its Native American, mining, and logging legacies. Numerous sightings of Bigfoot -- described as a man-like, hairy creature, seven to eight feet tall, weighing from 350 to 800 pounds and smelling like week-old fish -- have been reported near Willow Creek. The community hosts an annual Bigfoot Daze Festival each Labor Day weekend. of towering redwoods One morning we strolled secluded, sandy beaches near Trinidad, a fishing village 20 miles north of Eureka. The surf pounded and foam sprayed. At Patrick's Point State Park we wandered along the two-mile beach, and at Trinidad Beach State Park we beachcombed along a shoreline graced with a natural arch and weirdly shaped rocks. Other beach visitors flew kites that spun and twirled in the fickle breeze. That afternoon we slogged over soggy trails in Redwood National Park, one of four parks managed cooperatively as Redwood National & State Parks. 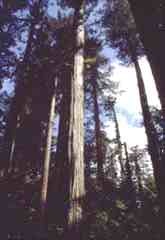 Coast redwoods, the tallest trees on earth, spire to heights of more than 360 feet and live more than 2,000 years. At the Redwood Information Center, a mile south of Orick and 40 miles north of Eureka, we mapped out a hike along the Tall Trees Trail, a 2.6 mile loop through a section of forest that easily predates the impacts of man. We were also lured by Orick's Highway 101 exhibits, a virtual forest of chain saw carvings that line the roadway, known as the "Burl Art Capitol of the World." A Glorious Town, a "Glorious Founder"
Originally founded by dairy farmers and ranchers in 1852, the town of Ferndale is listed as a California Historical Landmark. Located 16 miles south of Eureka, Ferndale is full of Victorian homes and regarded as one of the "Prettiest Places in America." Horse-drawn carriages travel its streets. Main Street features art galleries, antique stores, a live theater, working blacksmith and saddle shops, two museums, restaurants and boutiques. Happily, Ferndale feels genuine, not tourist-trap trendy. Ferndale is a rarity, a town that seems comfortably stuck back in time. And one of its new-age pioneers, Hobart Brown, typifies the town's spirit. Sculpture Races In most towns the mustachioed Hobart Brown  outfitted in overalls, a long-sleeved white shirt accented with a white bow tie, wearing a medallion proclaiming "For the Glory" and sporting a formal black jacket and Mad Hatter black top hat  might seem unusual. However, in Ferndale, Hobart is a modern day pioneer and founder. 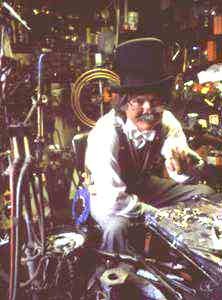 On a whimsy  in 1969 he decided to make his son's bicycling "more interesting"  he created the Kinetic Sculpture Race, a three-day event held each Memorial Day weekend. 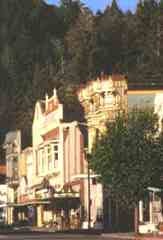 The race runs from the Arcata Plaza in Eureka to downtown Ferndale. Along the way, the human-powered contraptions travel roadways and sand dunes, cross the open bay, and float the Eel River. "It's like a stage play, an illusion. It's like crossing the prairie in a schooner. It's like space age. It's wonderful, it's miserable. Right now," Brown told us, referring to a typhoon-like downpour outside, "they don't like it. But years from now they'll talk about this day. Our problems are our rewards. It's part of our heritage -- to compete, to be challenged." Enjoying the Kinetic Sculpture Race and the other pleasures of Humboldt County is indeed challenging. Why? Just like searching for Bigfoot, there's so much else to see. 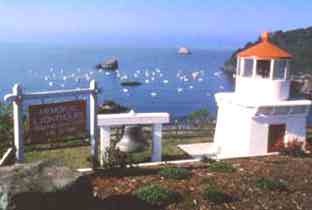 Click here for details to plan your own trip to Eureka and Humboldt County.